2016-2017 Mac's AAA Midget Hockey Tournament Men's Division Semi-Finals Game. 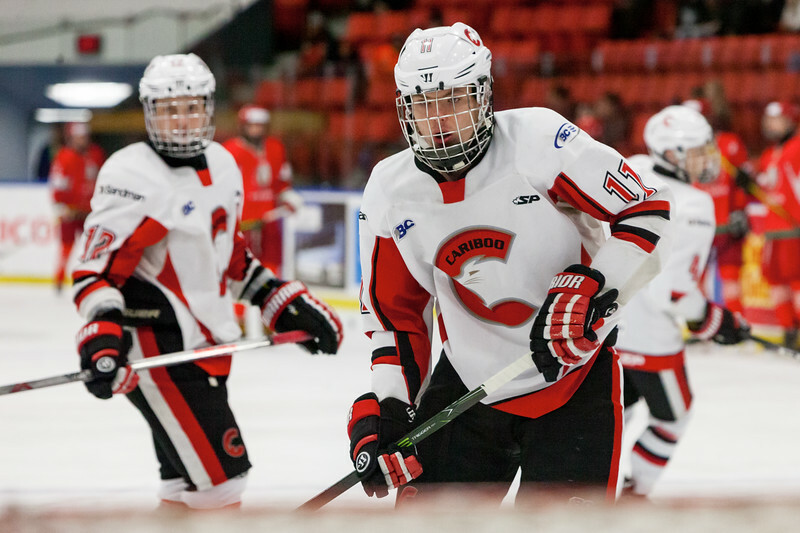 Cariboo Cougars vs. Belarus National U17. Watermarks will not appear on purchased products/photos. 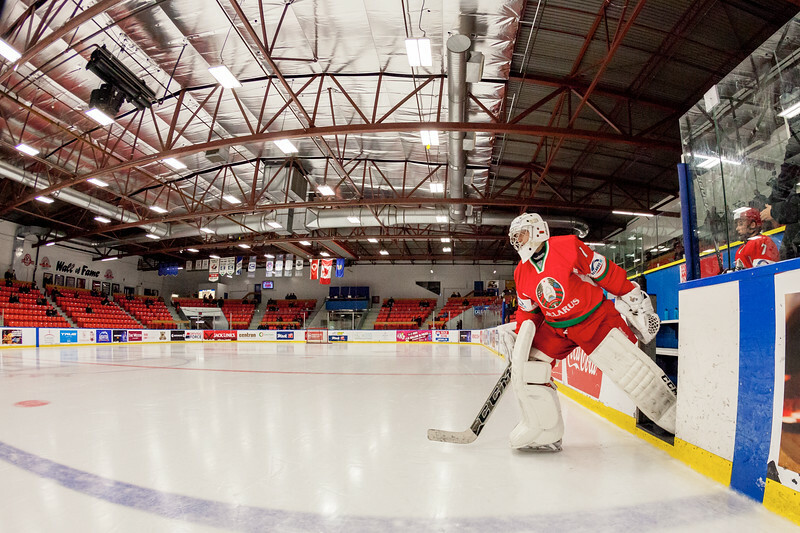 December 31, 2016 - Mac's Midget Tournament, Max Bell Centre, Calgary, Alberta - Male Division Semi-Final - Cariboo Cougars vs. Belarus National U17 - Belrus Goalie #1 ANDREI GRISHENKO takes to the ice for the pre-game skate. 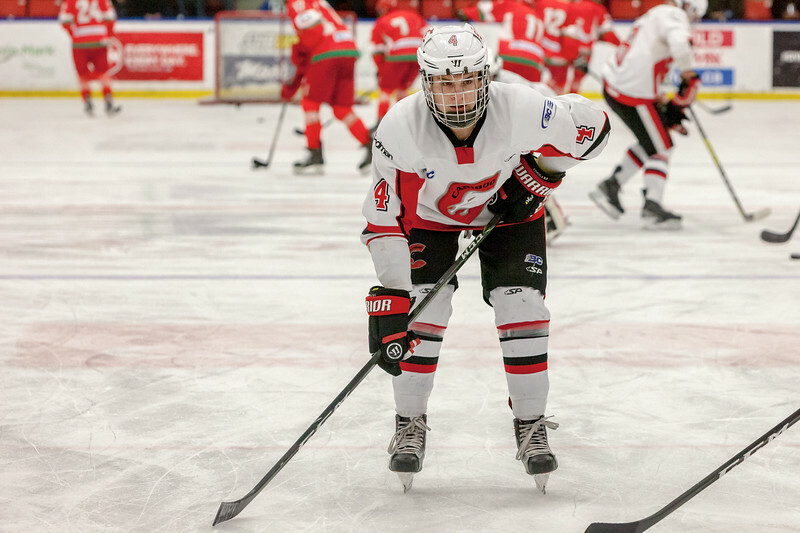 December 31, 2016 - Mac's Midget Tournament, Max Bell Centre, Calgary, Alberta - Male Division Semi-Final - Cariboo Cougars vs. Belarus National U17 - Cougars defender #4 Brennan Malgunas during the pre-game skate. 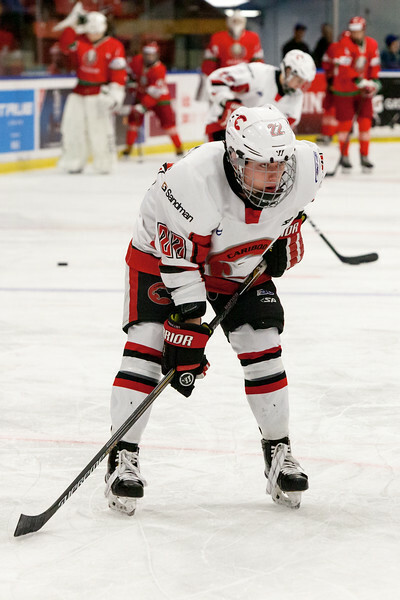 December 31, 2016 - Mac's Midget Tournament, Max Bell Centre, Calgary, Alberta - Male Division Semi-Final - Cariboo Cougars vs. Belarus National U17 - Cougars forward #23 Hunter Floris during the pre-game skate. 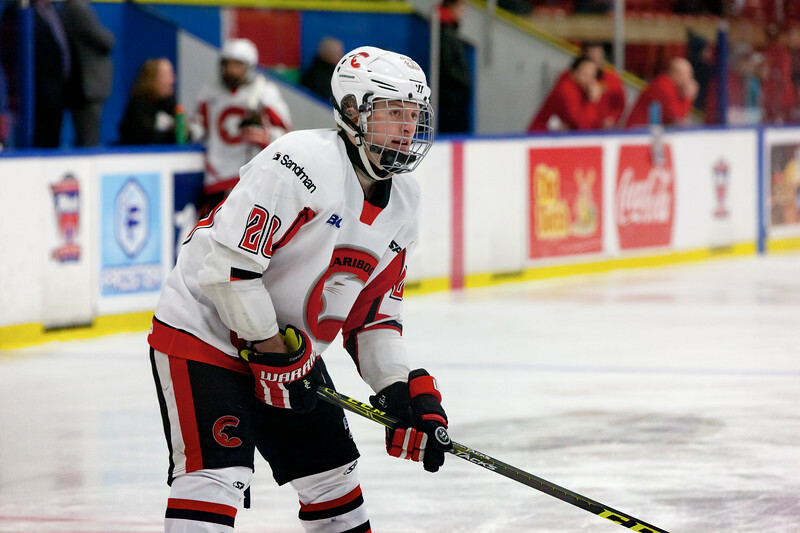 December 31, 2016 - Mac's Midget Tournament, Max Bell Centre, Calgary, Alberta - Male Division Semi-Final - Cariboo Cougars vs. Belarus National U17 - Cougars forward #22 Brandon Rowley during the pre-game skate. December 31, 2016 - Mac's Midget Tournament, Max Bell Centre, Calgary, Alberta - Male Division Semi-Final - Cariboo Cougars vs. Belarus National U17 - Cougars forward #20 Darian Long during the pre-game skate. 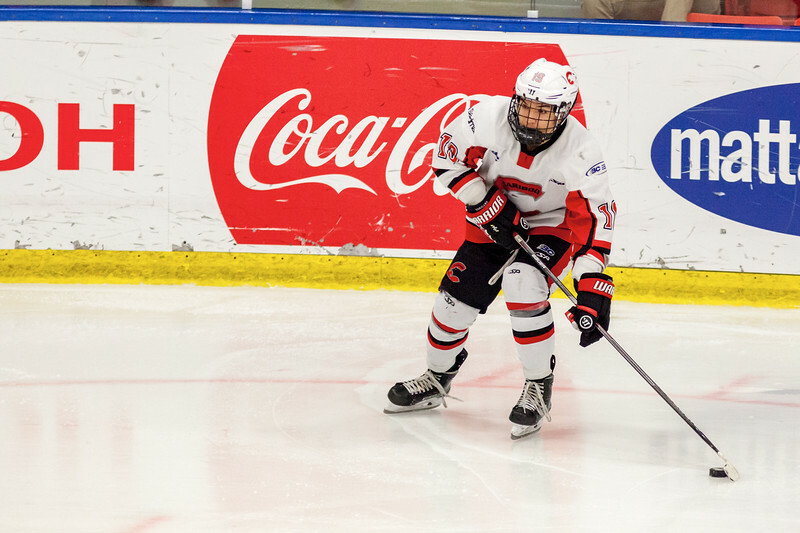 December 31, 2016 - Mac's Midget Tournament, Max Bell Centre, Calgary, Alberta - Male Division Semi-Final - Cariboo Cougars vs. Belarus National U17 - Cougars forward #11 Reid Perepeluk during the pre-game skate. 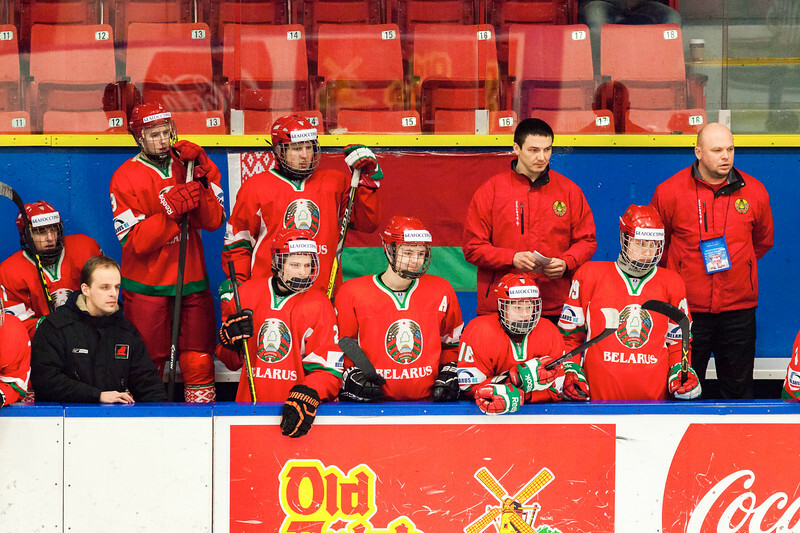 December 31, 2016 - Mac's Midget Tournament, Max Bell Centre, Calgary, Alberta - Male Division Semi-Final - Cariboo Cougars vs. Belarus National U17 - Belarus players bench. 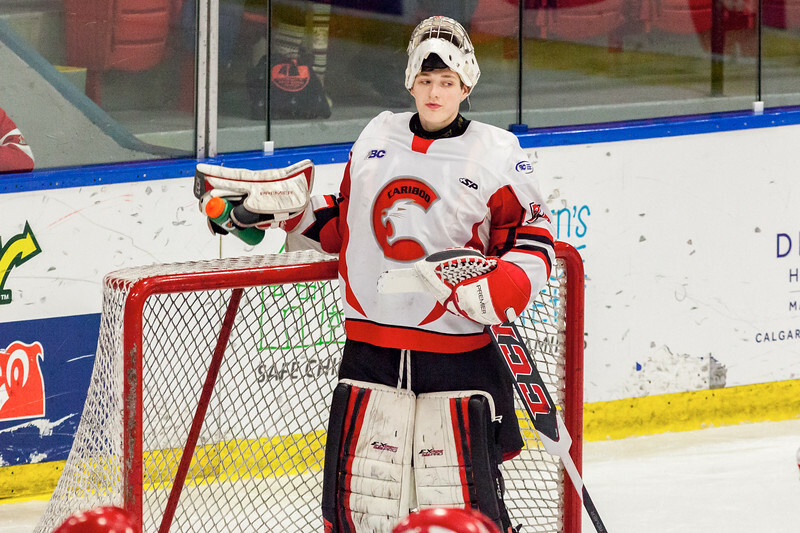 December 31, 2016 - Mac's Midget Tournament, Max Bell Centre, Calgary, Alberta - Male Division Semi-Final - Cariboo Cougars vs. Belarus National U17 - Cougars goalie #35 Zachary Wickson. 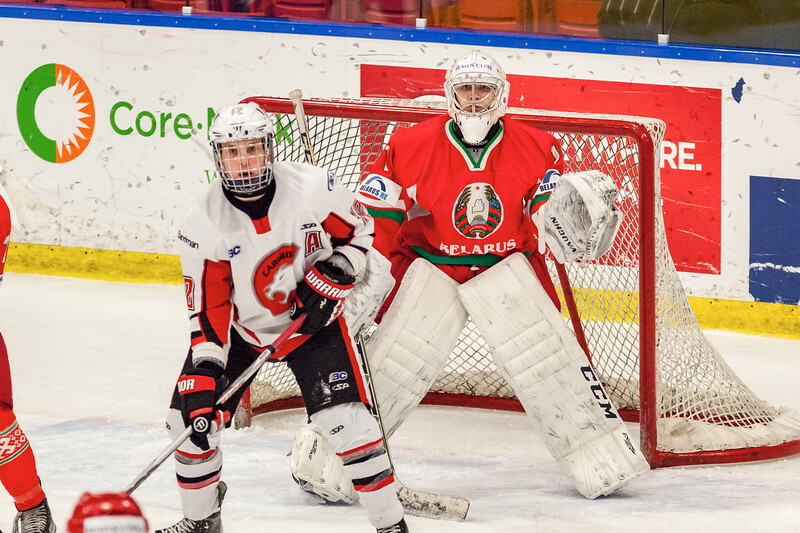 December 31, 2016 - Mac's Midget Tournament, Max Bell Centre, Calgary, Alberta - Male Division Semi-Final - Cariboo Cougars vs. Belarus National U17 - Belrus Goalie #1 ANDREI GRISHENKO and Cougars forward #12 Myles Mattila. 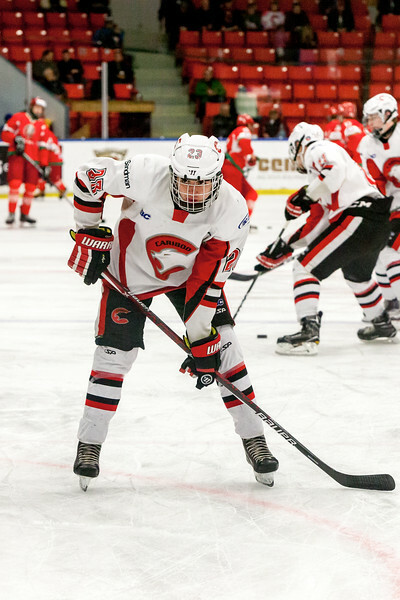 December 31, 2016 - Mac's Midget Tournament, Max Bell Centre, Calgary, Alberta - Male Division Semi-Final - Cariboo Cougars vs. Belarus National U17 - Cougars forward #17 Ty Kolle. 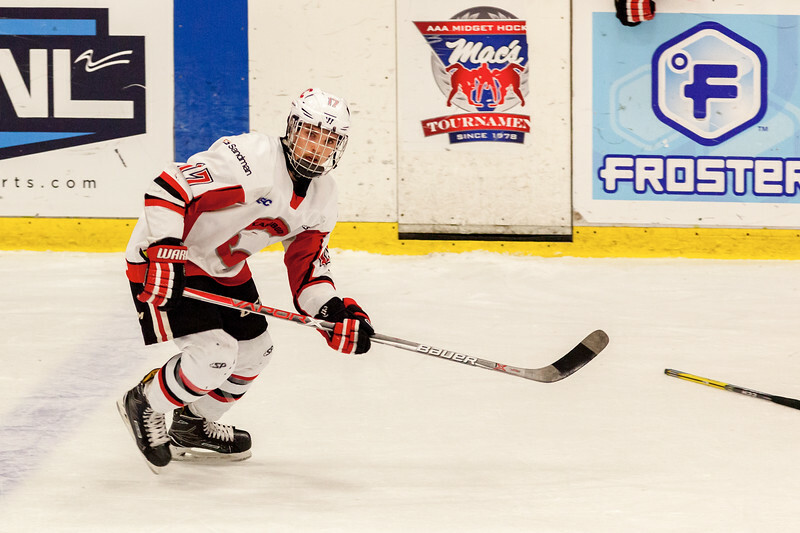 December 31, 2016 - Mac's Midget Tournament, Max Bell Centre, Calgary, Alberta - Male Division Semi-Final - Cariboo Cougars vs. Belarus National U17 - Cougars forward #23 Hunter Floris (white) and Belarus forward #10 KIRILL MEZHEINIKOV (red). 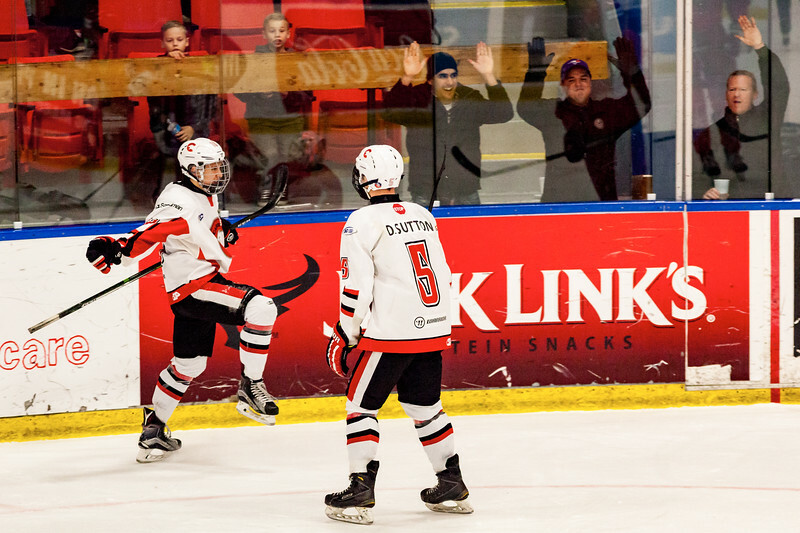 December 31, 2016 - Mac's Midget Tournament, Max Bell Centre, Calgary, Alberta - Male Division Semi-Final - Cariboo Cougars vs. Belarus National U17 - Cougars players #5 Devin Sutton and #18 Trey Thomas celebrate a goal. 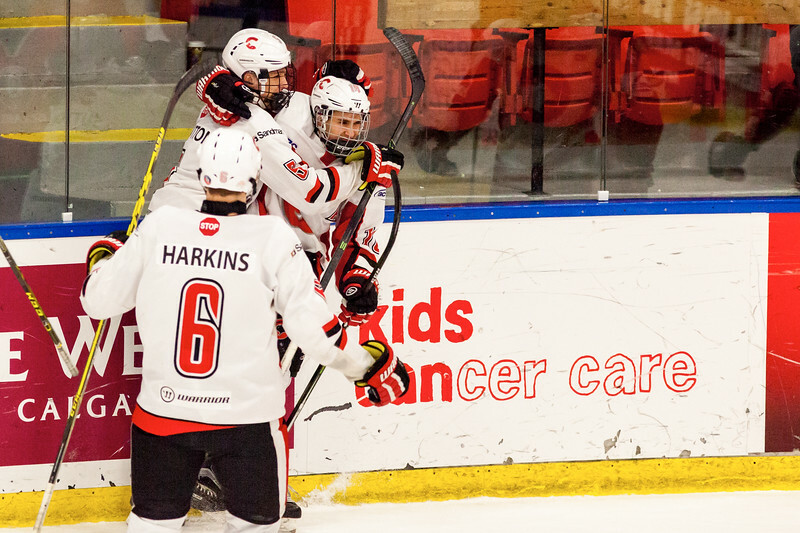 December 31, 2016 - Mac's Midget Tournament, Max Bell Centre, Calgary, Alberta - Male Division Semi-Final - Cariboo Cougars vs. Belarus National U17 - Cougars players #6 Jonas Harkins, #5 Devin Sutton and #18 Trey Thomas celebrate a goal. 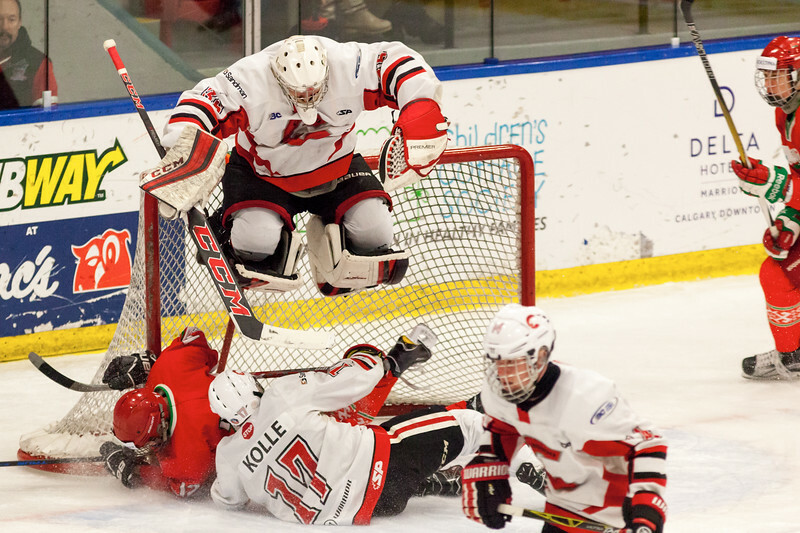 December 31, 2016 - Mac's Midget Tournament, Max Bell Centre, Calgary, Alberta - Male Division Semi-Final - Cariboo Cougars vs. Belarus National U17 - Cougars goalie #35 Zachary Wickson gets good air avoiding a collision of players at the net. 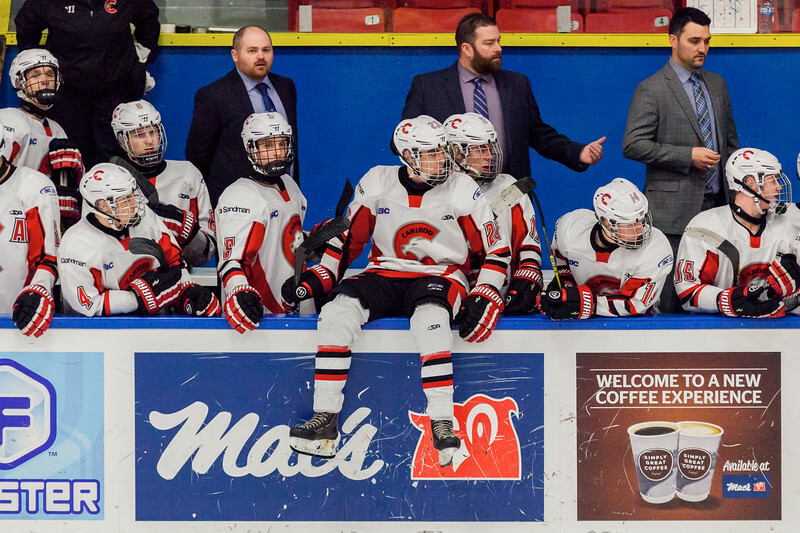 December 31, 2016 - Mac's Midget Tournament, Max Bell Centre, Calgary, Alberta - Male Division Semi-Final - Cariboo Cougars vs. Belarus National U17 - Cougars players bench. 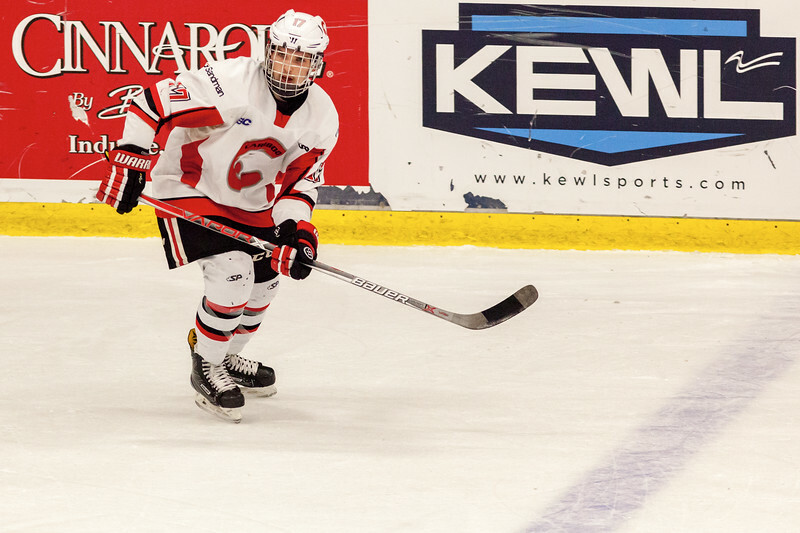 December 31, 2016 - Mac's Midget Tournament, Max Bell Centre, Calgary, Alberta - Male Division Semi-Final - Cariboo Cougars vs. Belarus National U17 - Cougars forward #19 Daine Dubois. 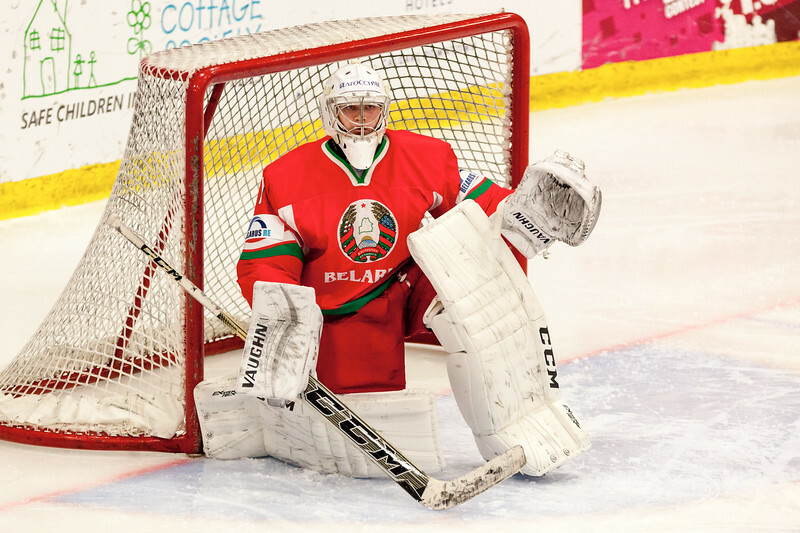 December 31, 2016 - Mac's Midget Tournament, Max Bell Centre, Calgary, Alberta - Male Division Semi-Final - Cariboo Cougars vs. Belarus National U17 - Belrus Goalie #1 ANDREI GRISHENKO. 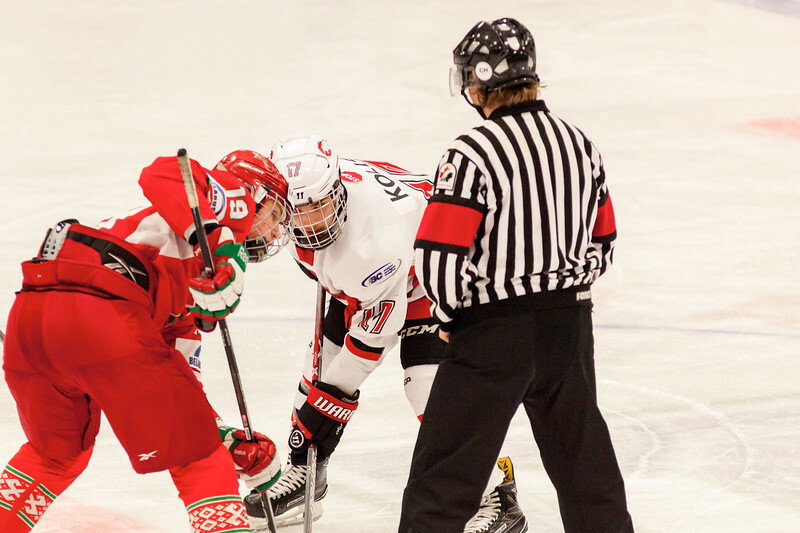 December 31, 2016 - Mac's Midget Tournament, Max Bell Centre, Calgary, Alberta - Male Division Semi-Final - Cariboo Cougars vs. Belarus National U17 - Cougars forward #17 Ty Kolle faces off with Belrus #19 VASILI FILYAYEV. 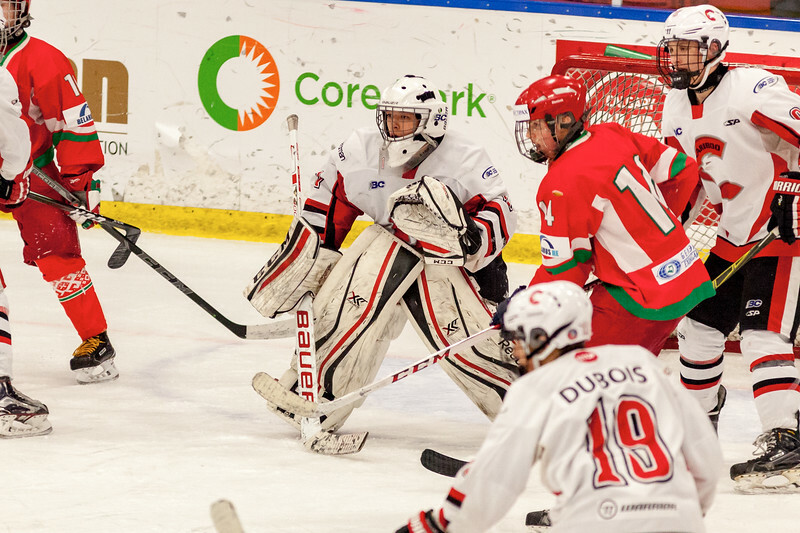 December 31, 2016 - Mac's Midget Tournament, Max Bell Centre, Calgary, Alberta - Male Division Semi-Final - Cariboo Cougars vs. Belarus National U17 - Cougars goalie #1. 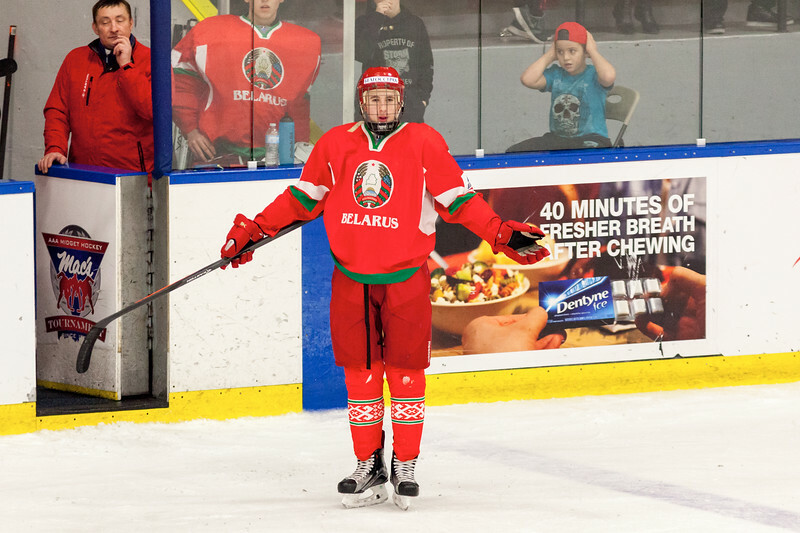 December 31, 2016 - Mac's Midget Tournament, Max Bell Centre, Calgary, Alberta - Male Division Semi-Final - Cariboo Cougars vs. Belarus National U17 - Belrus forward #9 SERGEI SAPEGO. 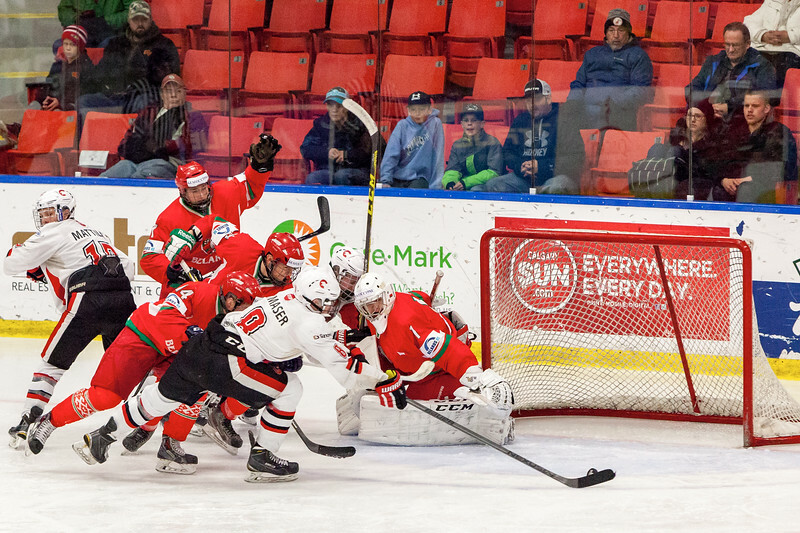 December 31, 2016 - Mac's Midget Tournament, Max Bell Centre, Calgary, Alberta - Male Division Semi-Final - Cariboo Cougars vs. Belarus National U17 - Cougars forward #8 Tyler Maser outreaches all Belarus players to put the puck past Belrus Goalie #1 ANDREI GRISHENKO. 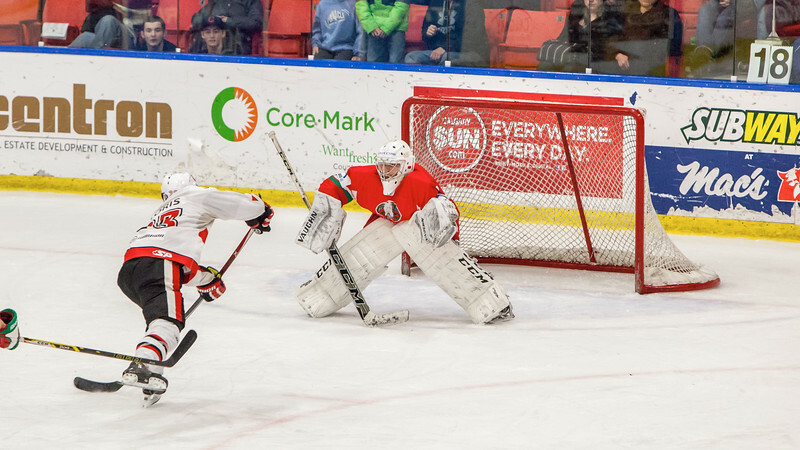 December 31, 2016 - Mac's Midget Tournament, Max Bell Centre, Calgary, Alberta - Male Division Semi-Final - Cariboo Cougars vs. Belarus National U17 - Cougars #25 stick handles the puck past Belarus #6 DMITRI SAVRITSKI. 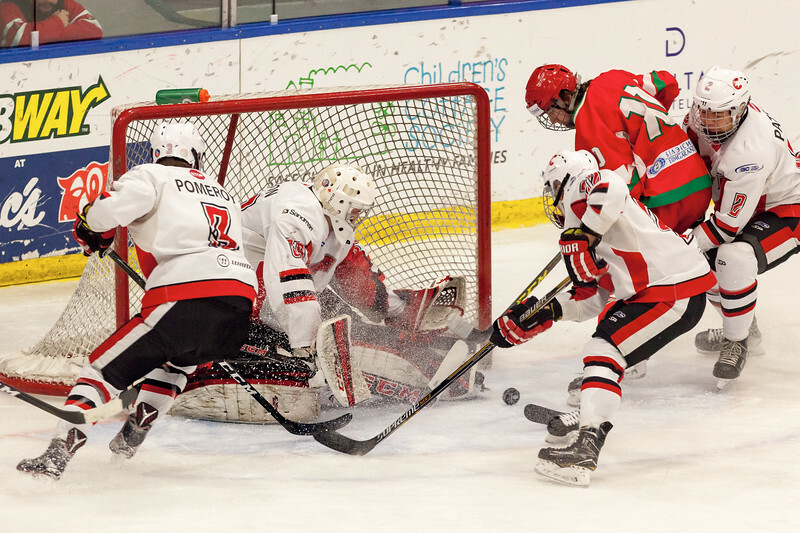 December 31, 2016 - Mac's Midget Tournament, Max Bell Centre, Calgary, Alberta - Male Division Semi-Final - Cariboo Cougars vs. Belarus National U17 - Cougars forward #23 Hunter Floris scores a late third period goal which would tie the game at 4-4 taking the game into over-time. 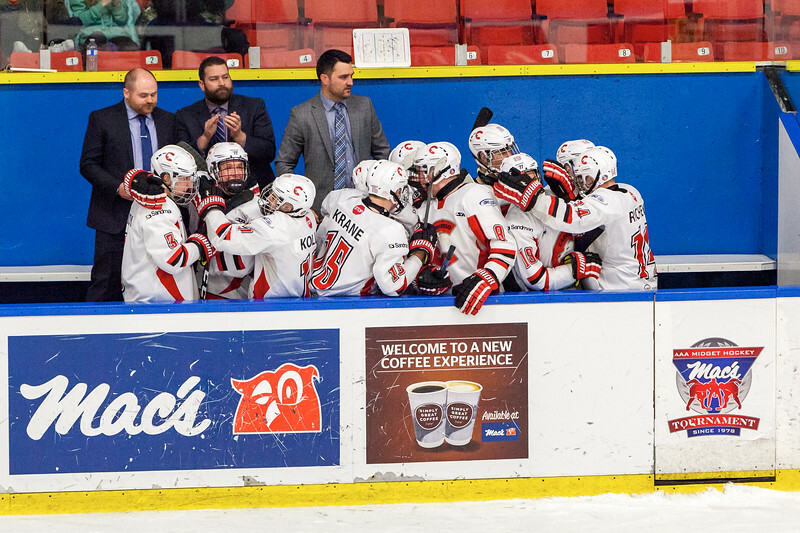 December 31, 2016 - Mac's Midget Tournament, Max Bell Centre, Calgary, Alberta - Male Division Semi-Final - Cariboo Cougars vs. Belarus National U17 - Cougars players bench celebrates #23 Hunter Floris's goal to tie the game. 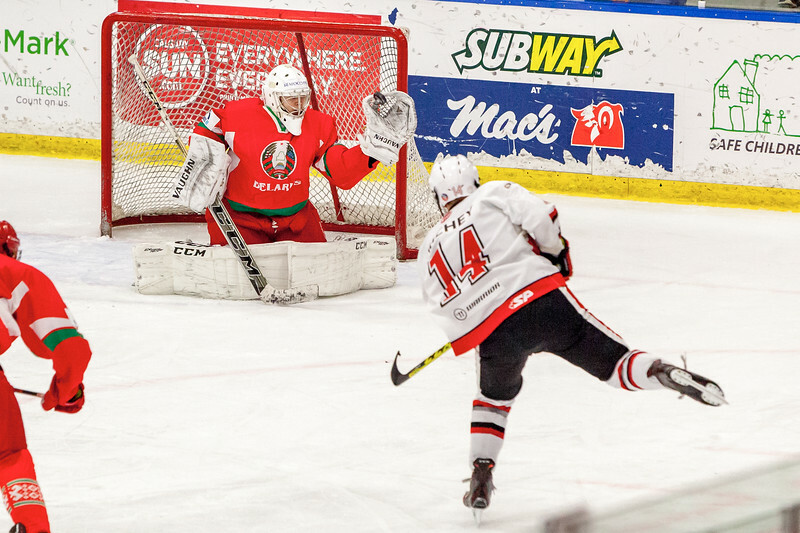 December 31, 2016 - Mac's Midget Tournament, Max Bell Centre, Calgary, Alberta - Male Division Semi-Final - Cariboo Cougars vs. Belarus National U17 - Cougars forward #14 Mason Richey shoots the puck on Belrus Goalie #1 ANDREI GRISHENKO during late third period action. 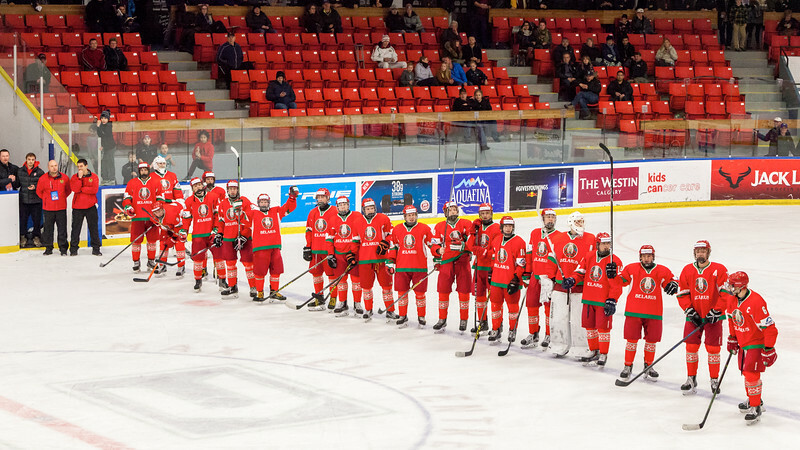 December 31, 2016 - Mac's Midget Tournament, Max Bell Centre, Calgary, Alberta - Male Division Semi-Final - Cariboo Cougars vs. Belarus National U17 - Belarus players celebrate after winning the semi-final and advancing to the Mac's Male Division Final/Championship game.